I started this link up over a year ago. I had wanted to start it for quite a while at that point, but was getting stuck on names. I have a habit of doing that actually. 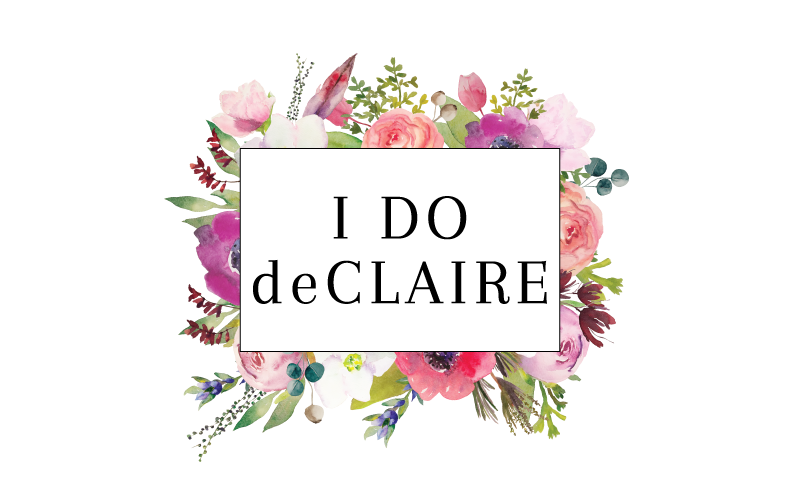 It took me a few days until I decided on I do deClaire. I like it when things 'feel' right and cannot make a decision on things until they do. So when Confident Twosday came to me, I knew it was the right name for what I had in mind. 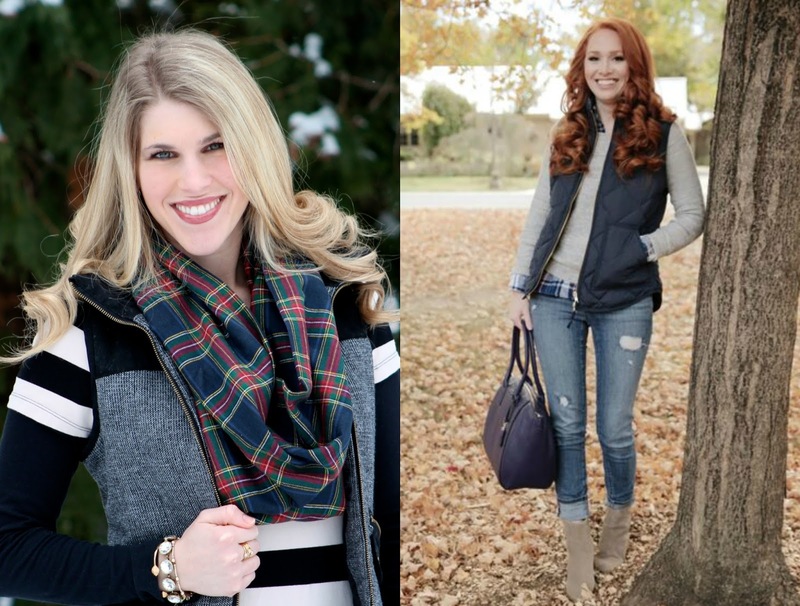 Over the year a few of my co-hosts have mentioned confidence in their blog posts. While it was the whole idea behind this link up, I am not sure why I didn't start talking about it more. I would love to start including why each outfit (or what part of each outfit) on Tuesdays make me feel confident. In this outfit, my red heels made me feel confident. Red is a power color and one that I typically shy away from. But these heels are such a happy red and a little bit of a heel really makes me feel confident. What is making you feel confident today? If you want to join me on twitter or instagram, use #ConfidentTwosday! Today Adriele from Style Assisted is co-hosting again. She has absolutely flawless style whether it's a casual look or something more dressy. 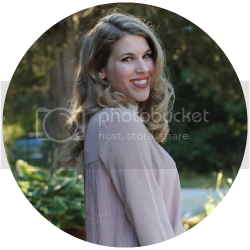 Her blog is the perfect mix of style, beauty, life, and motherhood. 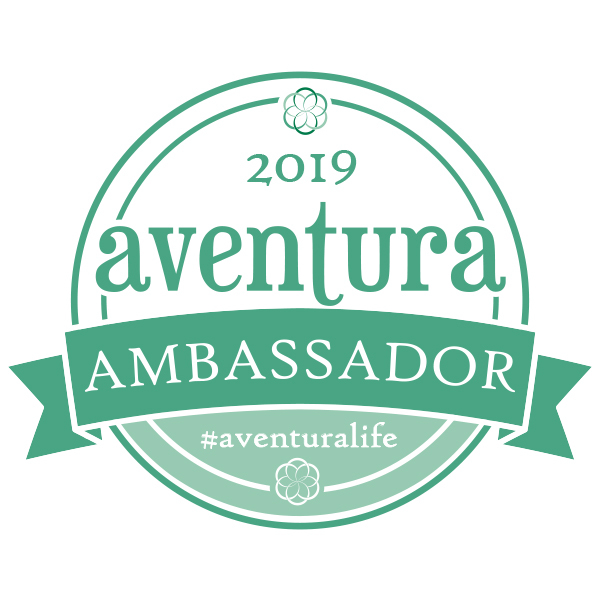 There is something for everyone so go check it out! I find all heels give me a little confidence boost! this sweater is so cute, love this layered look. Loving the layered look, but I really love the details on the sweater. You always have the cutest sweaters! I love the embellished details on your sweater and of course, the stripes! The red heels pull the whole look together! Such good pieces, Laura. I love the layering and then you added that to die for bag. Crushing on it for sure! Very pretty! I really like the pop of red your heels add. I have been loving that bag, too! I love the sweater & bag! Thanks for hosting the linkup. Red is the color that makes me super confident too. I cannot stop wearing red or my two pairs of red pumps lately. I want some cute patent leather ones again. And that embellished striped sweater - oh my. Nice that Adriele is co-hosting again. Her style is classic. 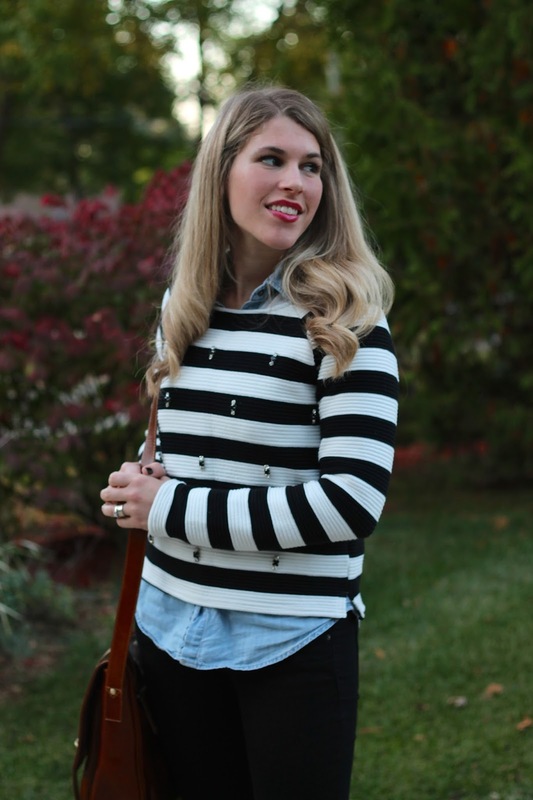 Love the stripes and the little details that come with that sweater! What a fun and new addition to Confident Twosday, I look forward to seeing what you choose each week, love those heels. Great addition to the link up. A good pair of heels always makes me feel confident too. I love your striped top. so pretty! everytime i see that top i want it!! Great look Laura and loving the red heels. I did read somewhere that one of the presidents always wore a red tie when he met with other political leaders because it represented power. I am not sure if this is true or not but it's good. Love that stripe top and it looks great layered over the chambray. The addition of the red pumps is perfect. That sweater is fantastic on you. Love the bit of red with your heels too - nice that they look low enough to wear all day and still be comfortable. Thank you for hosting! I'm new to your blog but you have such great things here. I love your sweater. I love the sweater! It's so bold and looks great with this look. Love your outfit! you look amazing! and the color of those shoes... love them! I am so in love with that sweater! 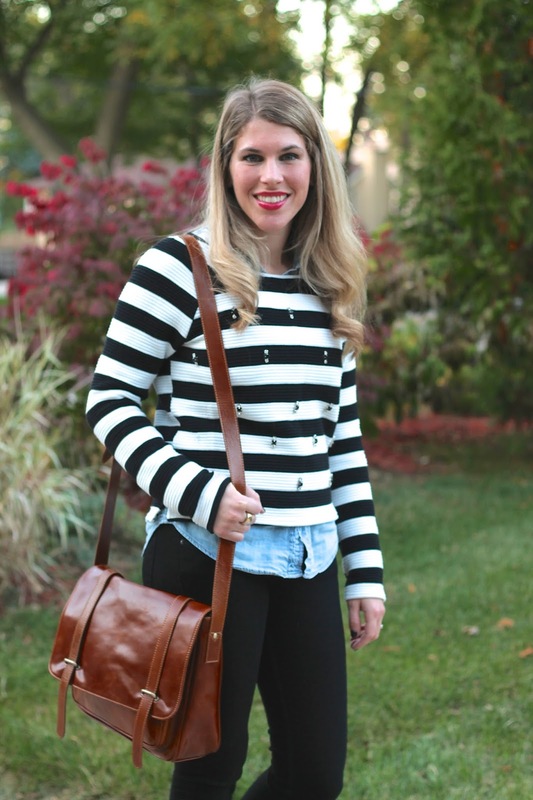 It has everything a girl needs in a sweater, jewels and stripes! The heels are a great pop of holiday! I know what you mean about red! I love it, a favorite color of mine You look great with the black and white, then the pop of red in the lip and shoes. I think confidence really shows if you are happy in what you are wering too. Love the pop of red from the heels and that embellished sweater! Perfect look for fall! I'm loving the little jewels on this sweater! And the red heels are a perfect touch. Colour has such an impact on our confidence and is often overlooked. I know that if I want to cheer myself up, I'll gravitate to not necessarily bright colours per say, but certainly rich colours; blues, reds, greens and pinks, so I completely get how those red shoes can boost your confidence. And that jumper is just so darn cute! Stripes and red heels are always a good combo! Love this look on you, Laura! I love this outfit and the heels are great! 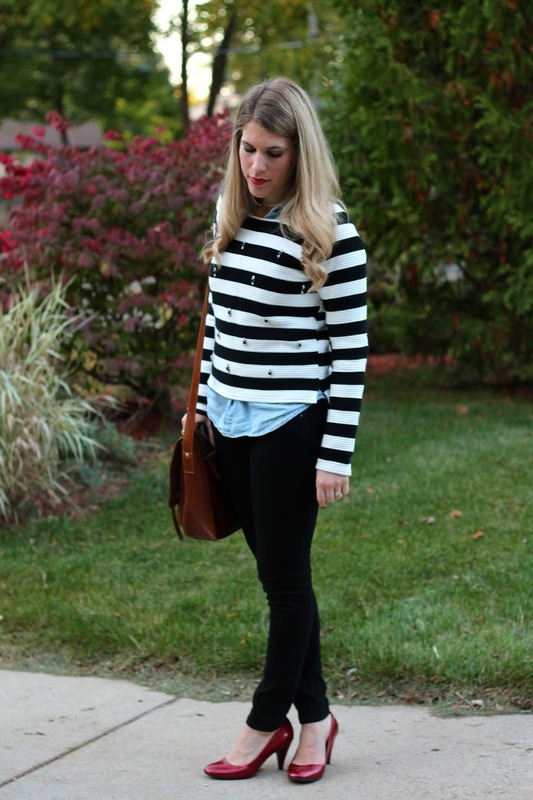 love that black and white stripe top! the embellishments are so fun! I love this top more and more every time you feature it in an outfit! The stripes + embellishments are just so cute! Great outfit! I love how the red heel makes it so sophisticated, although I shy away from red too! Your confidence definitely comes shining through :) Thank you for creating this space for all of us! Loving your sweater with the pretty embellishments. Stripes and chambray are a great pair! What a cute sweater! Love these eye-catching heels! Red is my favorite color for the holiday season. My eyes are fixed on your red pumps: what a great choice! I feel the same way about the color red. It's such a statement that it's hard for me to wear! I have a red coat I absolutely love but have to be in that "ready to take on the world" attitude to wear it. You've given me the confidence to wear it next time we go out!